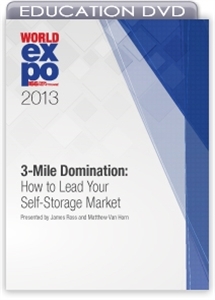 Most self-storage facilities have a sphere of influence of three miles or less. Because of over development in many markets, operators must focus their marketing efforts in a much smaller area. This session shows you how to dominate your three-mile market using technology, guerrilla and conventional marketing, customer service, revenue management and sales training. You'll also learn ways to incentivize facility managers and keep your "house" in order by reviewing and cutting expenses.